With 70% of employees working out of open offices in the U.S. alone, such workspaces are more a norm than a trend. While they cater to the needs of a fast-changing workforce, the flipside becomes all too apparent when one has a report to turn in and needs to engage in some focussed work. Suddenly, the ringing phones, the distant chatter from the café area and the colleagues at the next table discussing last night’s match, all become factors that hold you back from making that 5pm deadline. Why pay attention to office acoustics? Studies show that sound distractions occur once every 11 minutes on an average, leading to almost 86 minutes of the workday being wasted. Unfortunately, these distractions are not easy to ignore. The natural auditory tendency is to latch on to human voices, which diverts attention from concentrated work and breaks the train of thought. And every time that happens, one needs extra time to refocus on the task at hand. Even 5 such distractions over an 8-hour workday can reduce productivity by 15%. Slip-ups and errors are an obvious fallout of this, and with tasks taking longer to complete, employees end up staying late, leading to frequent requirement of sick leaves and early burnout. Work has become a lot more collaborative, so brainstorm areas and interactive spaces have all but replaced cubicles. Gone too, are the traditional office hierarchies. Entrepreneurs and start-up CEOs often discuss company strategies openly, with new employees and even interns being invited to contribute ideas at these meetings. 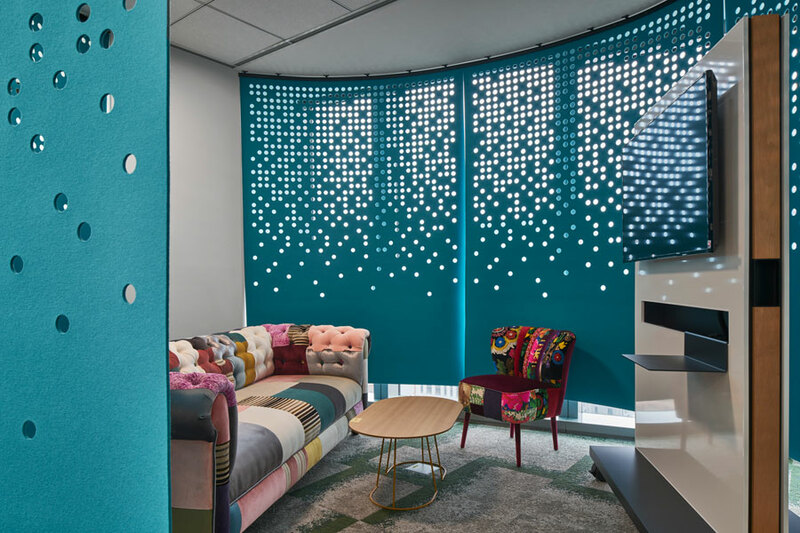 Given this new way of working, open-plan offices and meeting rooms do make sense, and eschewing their benefits to accommodate acoustic requirements is not the smart way forward. And that’s exactly why acoustic furniture is enjoying its moment in the spotlight. Hard surfaces reflect sound waves, causing reverberations that carry small noises across greater distances. Pieces that are designed to negate this effect are called acoustic furniture. Layered with felt, foam or sound absorbing fibre, they diffuse sound, offering a muted work environment. Here are 4 easy acoustic upgrades you can make in your office right now. These are ergonomic seating pods or hoods that offer employees some much-needed privacy and tranquillity. Cushioned for comfort and padded with felt on the internal surface, cocoons shelter the user from ambient noise, creating a hushed environment within. They usually come with essentials like charging points and USB ports to allow uninterrupted work. Some cocoons have in-built Bluetooth speakers and are fitted with LED lights that can be dimmed or brightened as per the user’s comfort. Cocoons can be easily detached and re-mounted at a different location, making them perfect for dynamic workspaces, shared offices and coworking spaces. These are sound absorbing panels made of sliced felt, used to insulate a room from external noises. They are mounted on walls and ceilings, with the help of hinges or moving steel arms that can be tilted or rotated in any direction. Unlike unsightly wall insulators, these flaps come in vibrant colours and elegant geometric or abstract shapes. Think of them as the newest kind of wall art! The soft felt surface lets employees pin documents and charts directly on to these flaps, making them ideal for meeting rooms and brainstorm areas. The privacy of a walled space, the approachability of an open office – that’s what acoustic wings offer. Wings are flat panels made of foam or fibre, which can be attached to the ceiling at a 90° angle to muffle disruptive noises. They partition off certain areas of an open office, acoustically and visually, creating a wall-like illusion without looking too harsh. They have the added advantage of cutting down screen glare and adjusting the brightness of a room. These are panels that can be arranged around a cluster of work desks to shield them from sound. They function as temporary walls that can be unmounted, collapsed and moved around the office. They may have a chic opaque finish for added privacy, or be made of soundproof glass if a company needs to retain an open feel. These panels are great for multi-departmental offices where different verticals need to work in tandem, but each team also requires some amount of privacy for internal meetings and catch-ups. Flexible and convenient, these options let you make the most of creative office designs without compromising on workplace productivity. Most importantly, it offers your employees the choice to work in comfort. If you are looking to enjoy the best of both worlds with your workspace design, contact us today.